I’m an early bird, you know. And I’m getting very excited about the new year, already. This one will be very special — cause it won’t be too long before I’m headed out of state. A new year in a new place. 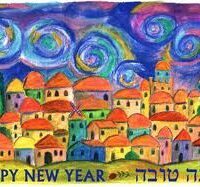 I wish all the very best of everything to everyone — even if you weren’t born Jewish. Just about everyone, I suspect, if you look closely enough, can track down a Jewish relative. I feel so proud being part of the tribe and when I get called a Jewish mother — I smile! Can’t always tell by the name, you know. Marvin Hamlisch and I got along really well when I took hm on his Portland publicity tour — but he didn’t think Pamela Bugbee, which I went by for the first four years, sounded Jewish, and decided, at the last minute, to have dinner with another Symphony member who had a more Jewish-sounding name. They didn’t quite click the way we did — but when she told him she wasn’t Jewish, they both had a good laugh. Sure, I missed dinner — but after a full work day, side by side with Marvin Hamlisch, I got a memorably juicy taste of an out-of-this world genius.